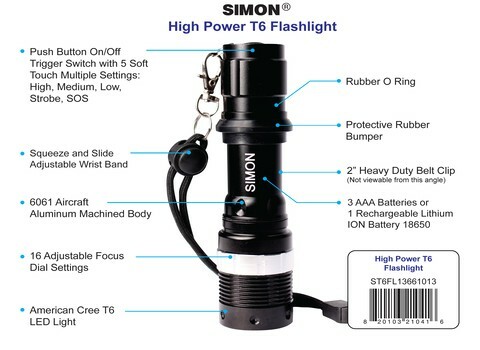 Simon T6 Pro LED Flashlight is popular among Ambulance Drivers, EMT, Security Guards and Polices Officers around the world for it’s versatility, light weight and rugged design. It is the brightest LED flashlight in the 500 lumens class of drivers for low wattage. If your looking for a good multipurpose LED flashlight that can be used for a wide variety of uses then you have to get the Simon mini Cree LED torch lite. It is small and compact and it mounts on most universal rail mounts for Rifle, Shotguns and Pistols. Most people use this flashlight as a handheld tool to help them in there everyday lives. So if you are looking for the best overall use of a 5 mode LED with 16 adjustable focus settings then this is the one to have. It is made from 6061 aircraft grade aluminum and weigh’s in at whopping 8 oz. or 227 grams and stands tall at 5.25 inches. 1. You folks at Simon keep referring to how the T6 can be mounted on a firearm but I find no information on the hardware needed to do that. 2. How can you mount the light using the 1″ portion of the flashlight’s barrel when the belt clip occupies that space? 1. The Hardware needed is available at most gun stores or you can look for it online. You will want a 24.5mm or 1 inch flashlight mount for a weapon using a picatinny or weaver rail system depending on what you have mounted on your weapon. 2. All you have to do is Remove the pen clip from the Flashlight and then mount it on the Flashlight. Then clamp to mount on the picatinny rail on your weapon.